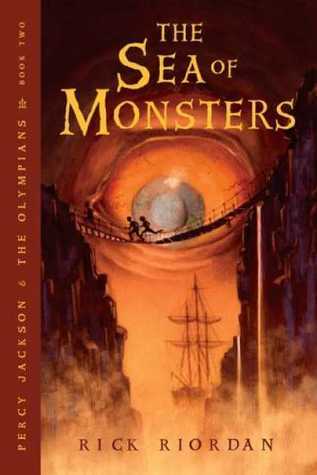 This 2nd book in the Percy Jackson and the Olympians series suffered a bit from the Sophomore Slump. I liked it, but it lacked a little bit of the magic for me. Basically, the first book was wonderful because it was unexpected. I thought it was going to be a cheap imitation of Harry Potter, and though there are similarities of course, it held it's own. It was funny in a slightly edgier way, and Percy really stood out as his own character. I liked the self-discovery and the problems he faced, and the dangers were fun because I could see the ties to mythology without being hammered over the head with them -- they fit in an interestingly quirky way. With this one, though it was fun and funny, Percy is more discovered than discovering, the dangers he and his friends phased were...predictable and too easily defeated, and it all felt a little more Deus Ex than I would have liked. (And yes, I know it's a book about gods, so there's really no avoiding the Deus, per se... Still, though.) But more than that, there was just an indefinable something that I just wanted and didn't get. But that being said, I still highly recommend this series (so far. I mean, I'm only 2 books in.) These things that I mentioned I don't think would be picked up on by kids. And maybe it's just that the shininess wore off. When you get past that, they are really fun, slightly quirky books that make great use of mythology to open that world to kids and let them use their imaginations. What's great, too, is that even though the storylines they use are ancient, the books themselves turn them into something that feels very modern and new. Riordan works the mythology into the present day in such a purely fun way that I have to give him credit. I still think, sophomore slump or no, that my myth-obsessed mind would have been fairly obsessed with these books as a kid.